The most incredible news for this week in cloud computing is a huge research report by Forrester Research, a premium research firm, called ‘Sizing The Cloud’. This report applies Forrester’s sizing methodology for emerging markets to the cloud computing market for the first time. With some of the cloud computing definitions still posing a challenge, Forrester has decided to focus on the business models of the cloud under which IT operates. 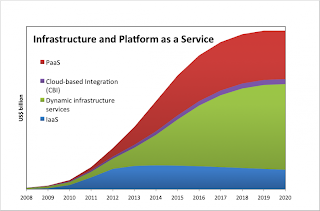 According to the report, Platform-as-a-Service (PaaS), which has been slowly emerging now, is going to be the leading cloud market by 2020 with ISVs finding a highly attractive option for delivering Software-as-a-Service (SaaS). Forrester Research says that the global cloud computing market will grow from a $ 40.7 billion in 2011 to $ 241 billion in 2020. Cloud communications is Internet-based computing whereby shared resources, software, and information are provided to computers and other devices on demand, similar to the electricity grid. Cloud communications encompasses several variations of service models including Infrastructure as a Service (IaaS), Platform as a Service (PaaS) and Software as a Service (SaaS ), and includes deployment models like private, public, hybrid, and community clouds. The term means more than just VoIP, CaaS or Unified Communications. Cloud communications is also becoming an attractive option because the cloud can now become a platform for voice, data and video. Why Should I Be a SaaS Affiliate? And What the Heck is SaaS, Anyway? With the rapid rise of Internet and software companies around the world, there’s naturally a growing need for affiliates to help sell their products, and there is nothing to look beyond the SaaS market which is just booming. Understanding the technicalities of SaaS is not enough, it very important to understand the marketing aspects of it. One should remember that marketing a service is very different from marketing a product. Cloud computing offers a number of potential benefits including cost savings and improved business outcomes. However, there are a variety of information security risks that need to be carefully considered. Risks will vary depending on the sensitivity of the data to be stored or processed, and how the chosen cloud vendor (also referred to as a cloud service provider) has implemented their specific cloud services. When you think about private cloud computing there are clusters which are probably the most advanced form of shared infrastructure we have in the enterprise today. Right now, most of those clusters are in place because of the unique performance and availability attributes of a particular application. But as the march towards private cloud computing continues, it seems that a convergence between clustering technologies and cloud computing is almost inevitable. Cost Challenges in cloud are a growing concern and are being met with new Cost Optimizations tools that can peer at a granular level for an example, departments, agencies or groups by Cloud Cruiser to assist with the transition or managing of businesses in the cloud. New cloud implementations and existing Cloud deployments need to be able to peer into the costing model and have alerts when there are critical change and Cloud Cruiser offers just the tool for that. http://www.cloudcruiser.com Also, take a look at the test drive of this product that can help you understand the cloud computing value for your company.